Thank you, thank you to my friend G for her method of making this delicious bread. So simple and so tasty. 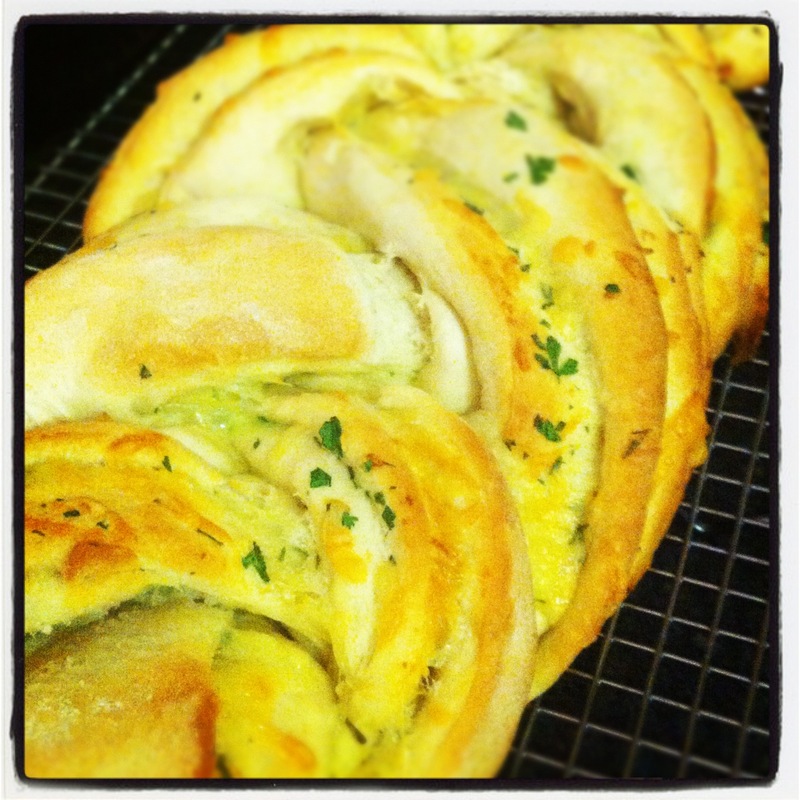 For the bread dough, simply make the pizza dough that I have posted on this blog. Allow the dough to prove for 40-60 minutes. Meanwhile place 3 cloves crushed garlic and 2 tablespoons of chopped fresh flat-leaf parsley in 1/4 cup olive oil to infuse. Pre-heat the oven to 180C. Once the dough has proved, punch it to knock out all the air and turn onto a lightly floured bench. Knead by hand for 5 minutes or put it back in your TMX and knead (closed lid position) for 1 min 30 sec. 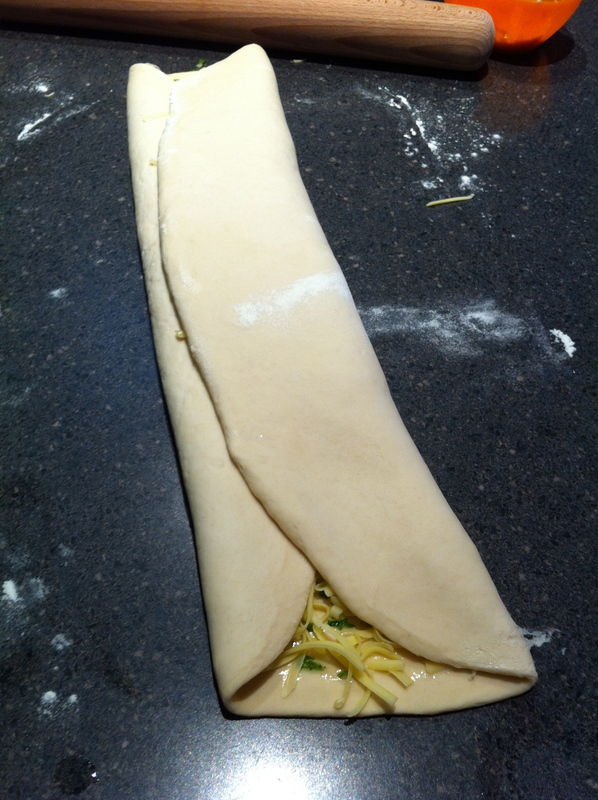 Flatten the dough a bit by hand to a rectangular shape and roll out to approx 2cm thickness. 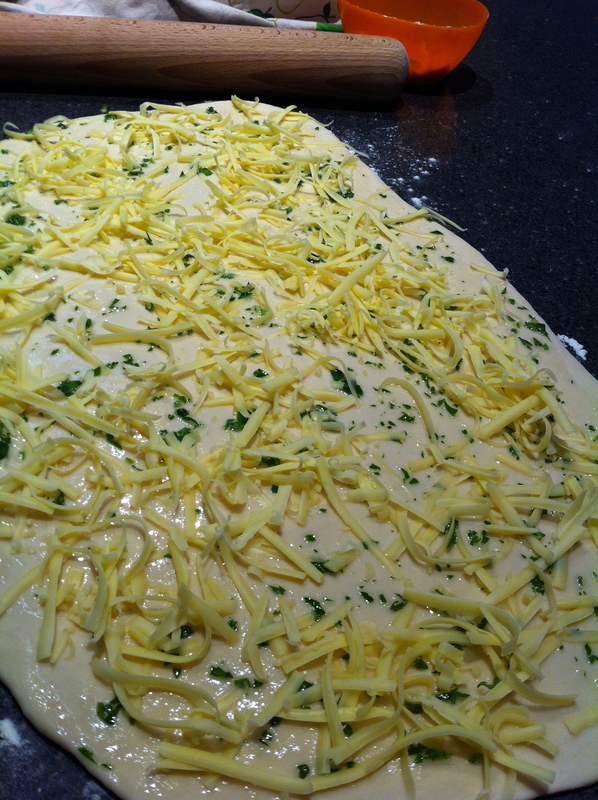 Spread your rectangle with the garlic & herb oil then sprinkle over 1/4 cup grated cheese. 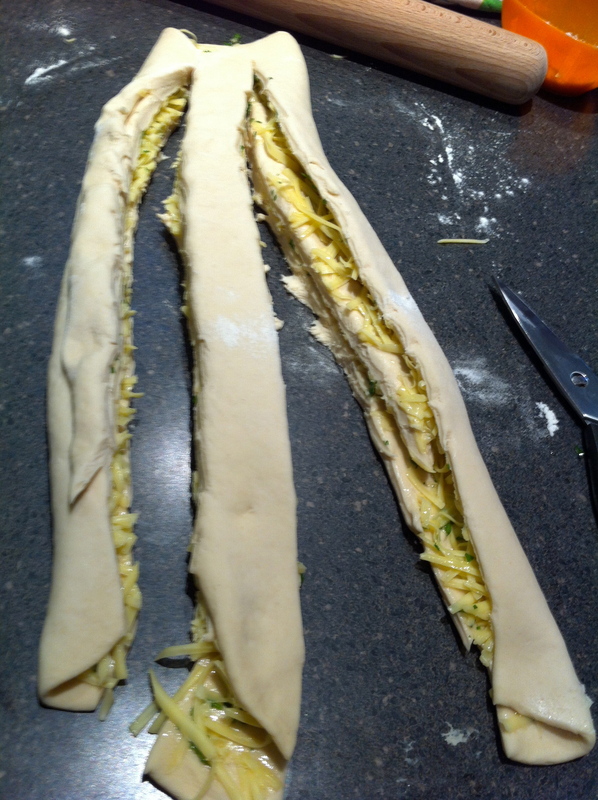 Roll up your dough like a long swiss roll and gently flatten with your hands. Using kitchen scissors or a sharp knife slice into three lengthways and plait. You should end up with some of the dough with the infused oil and grated cheese facing outwards and some tucked inside the loaf. 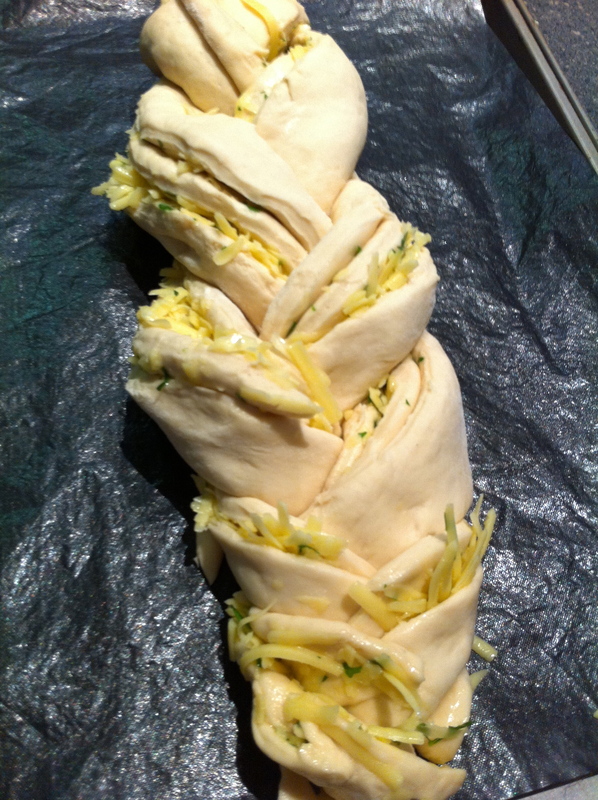 Place your plaited loaf on a baking tray with a baking sheet or greasproof paper underneath. Cover with a clean tea towel and leave to prove a second time for 40-60 minutes. Bake for 12-15 minutes at 180C. This bread is absolutely amazing fresh from the oven but is also delicious the next day in your family’s lunch boxes. Yum! 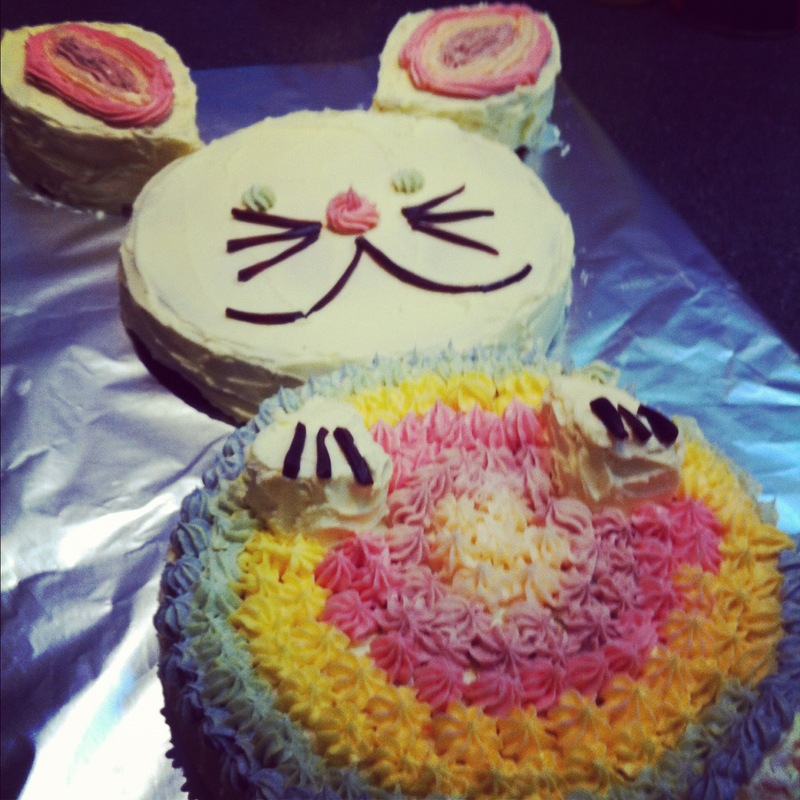 I iced this cake with butter icing (butter and icing sugar whipped together) and made my own natural food colourings. I was so proud of the finished product. The colours looked great and contained absolutely no nasty additives. I try to avoid additives and preservatives in my family’s food as much as possible. Children’s birthday parties are often where everyone seems to throw caution to the wind and fill kids up with not only sugar but nasty chemicals found in additives and preservatives. I’m not saying you shouldn’t have treats and yummy party foods, but there is no need to overdo it. I definitely find that if my kids eat some filling, healthy food then have some cake without food colourings their behaviour is so much better than if they’re full of lollies, chips and food colouring. I try to make at least some of our party food from scratch (have a look on my Lunchbox Legends page for some ideas) and minimise the food colourings. 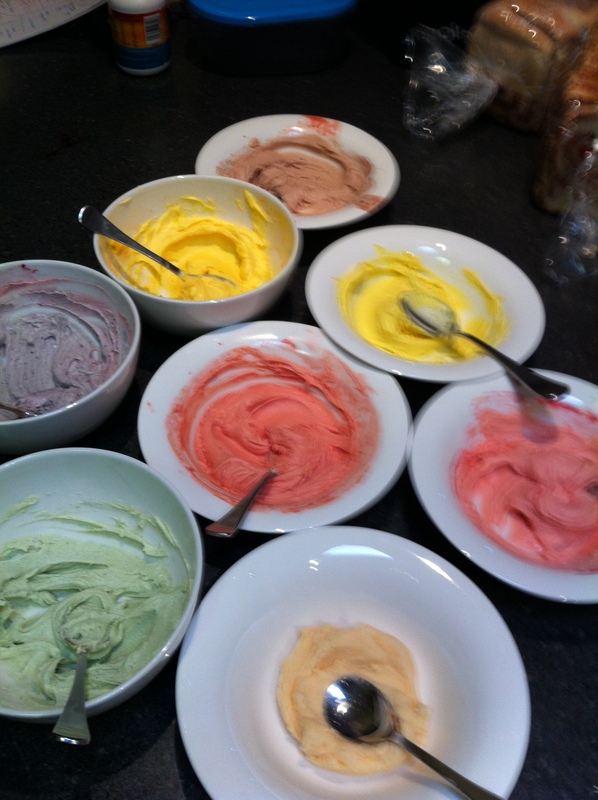 It really was easy to make these food colourings and would have been even quicker if I’d only had to do 1 or 2 colours! When looking at the additives and preservatives in food colouring, common e-numbers include 102, 122, 124, 133, 210, 211, 216 and 218. All of these are considered dangerous, many are suspected carcinogens and linked to behavioural problems, hyperactivity and asthma. Many are banned in some european countries and the USA. It still amazes me how other countries completely ban these chemicals and yet they are readily found in may of our everyday foods. There is an excellent book called Additive Alert by Julie Eady, a Perth Mum, which is a must-read for everyone, especially parents. This book contains excellent information on the dangers of additives and preservatives in our foods, what to avoid and how to read food labels. Most usefully it has comprehensive, easy to use tables of additives and their effects both by name and number. You can order online for $22 including postage or buy from bookstores or Big W. I also have an app on my phone, e food additives, which is handy in the supermarket. Pale pink from raspberries – gently cook fresh or frozen raspberries for a few minutes then juice through a sieve. Add 1/2 tsp at a time to icing and mix well. Dark pink from blackberries – gently cook fresh or frozen blackberries for a few minutes then juice through a sieve. Add 1/2 tsp at a time to icing and mix well. Blue from blueberries – gently cook fresh or frozen blueberries for a few minutes then juice through a sieve. Add 1/2 tsp at a time to icing and mix well. Add a small pinch of bicarb soda at a time to change colour to blue. The bicarb tends to keep reacting over time so leave for a few minutes before adding more. I promise you that no one will taste these additions to your icing. I have served cakes with these icings at quite a few parties now. In total over 40 kids and 60 adults have eaten them without raising anyones suspicions! In fact, my 5 year old and 3 year old girls were very impressed with how I made the colours and declared that ‘you can’t even taste it!’. These are just the colours I experimented with. I’d love to hear how you go making your own. I’ve read that spinach juice can give a good green and I’d say red cabbage would work well too. Definitely experiment by adding a small pinch of bicarb soda and watch how your colours change. Give it a few minutes to work – on this cake my outer circle of icing was fairly purple when I put it on but by the time I served the cake it had turned a very satisfactory blue. Also, I’d say if you had the time to cook down the juices you’ve made that you would get more intense colours. There are natural food colourings and sprinkles available to buy from an Australian Company called Hopper Foods. I haven’t tried these but they do look good. There are some notes on the food colourings that they need to be kept in the freezer, have a use-by date, react to light and work better in acid environments like lemon icing. I also found sprinkles with natural food colouring (still additives but only those that are considered safe) in my local Woolworths. Another Perth business, Arch & Jax, provides organic (additive free) party supplies like sprinkles and lollies, as well as environmentally friendly party supplies. Again, I haven’t used these guys yet but they look excellent. Hopefully I’ve given you the motivation to try your hand at making your own food colourings for your next party. Happy Experimenting!